How can a TBI affect driving ability? How often do individuals with TBI return to driving? Driving is an important part of a person's independent lifestyle and integration into the community. Because we take our driving skills for granted, it is easy to forget that driving is the most dangerous thing we do in our everyday lives. A brain injury can affect the skills needed to drive safely. If and when an injured person may safely return to driving should be addressed early in recovery. The injured person, family members, and health professionals should all be included in this important decision. If anyone has concerns that that driving may put the injured person or others in danger, health professionals may recommend pre-driving testing. Ability to maintain a constant position in a lane. Maintaining concentration over long periods of time. Memory functioning, such as recalling directions. Figuring out solutions to problems. Studies indicate that even mild thinking difficulties, which may not be recognized by the injured person, may add to increased risks while driving. Not observing signs or signals. Judging distance inaccurately when stopping or turning. Becoming easily frustrated or confused. Having accidents or near misses. Drifting across lane markings into other lanes. Getting lost easily, even in familiar areas. Between 40 and 60 percent of people with moderate to severe brain injuries return to driving after their injury. To lessen the risk of crashes, people with TBI may place limitations on their driving habits. They may drive less frequently than they did before the injury or drive only at certain times (such as during daylight), on familiar routes, or when there is less traffic. Having experienced a seizure after the TBI may be a barrier to driving. States often require that a person be free of seizures for a period of time, such as 6 months, before resuming driving. People who want to return to driving need to check with the laws in their state. A driving evaluation is a crucial step in determining a person's ability to drive following recovery from a TBI. Research studies indicate that most TBI survivors are not thoroughly evaluated for driving skills before they begin driving after the injury, and this may put TBI survivors at risk for a crash. Preliminary Evaluation: A review of cognitive (thinking) abilities, including reaction time, judgment, reasoning and visual spatial skills. Recommendations regarding the need for adaptive equipment and additional skills training are based on the results of the evaluation. 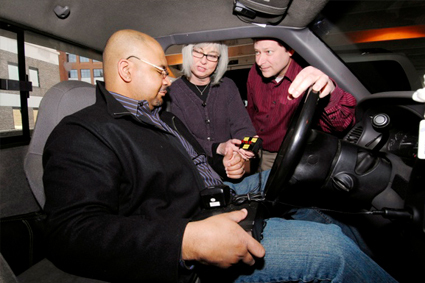 On-the-Road: A test of the mechanical operation of a vehicle, either using a driving simulator or driving a vehicle on the roadway in the presence of the evaluator. This evaluation is used to assess safe driving skills in various traffic environments, as well as basic driving skills while a client uses the appropriate adaptive driving equipment. Current research indicates that many individuals with TBI can become competent, safe drivers when given the proper training. Training serves to improve specific driving skills. Sometimes this involves practicing driving under the supervision of a driving evaluator. In some cases a training program might focus on specific skills such as rapid understanding of visual information. If an individual with TBI has physical disabilities but has well-preserved cognitive functions, the individual may be able to resume driving with adaptive equipment and/or other modifications to the vehicle. Hand-controlled gas and brake systems. Lifts for entering and exiting the vehicle. A person who wishes to resume driving must have a valid driver's license. In some states there must be a formal evaluation performed by a licensing bureau before resuming driving after a brain injury. Insurance may also be required. The person should check local regulations relating to licenses and insurance. Accessible and reliable transportation is the most critical part of community integration following a TBI. If a person is not able to drive, there may be other options for transportation. Family members can provide transportation, and public transportation such as buses can be used. Some communities provide public transportation specifically for disabled riders. Step-by-Step: Should you be driving? Brain Injury Association of America. Association for Driver Rehabilitation Specialists. National Mobility Equipment Dealers Association. Eby, D. W., Molnar, L. J. (2010) Driving Fitness and Cognitive Impairment. JAMA. 303(16):1642-1643. Our health information content is based on research evidence whenever available and represents the consensus of expert opinion of the TBI Model Systems directors. Driving after TBI was developed by Thomas Novack, PhD and Eduardo Lopez, MD in collaboration with the Model System Knowledge Translation Center. Portions of this document were adapted from materials developed by the University of Alabama TBI MS and JFK Johnson Rehabilitation Institute TBI MS and from Driving After Brain Injury (reprinted with written permission from the Brain Injury Association of America, Inc. 2007).